option to upload their original music or sound. - Best Participation Award: Every three days, Tik Tok will select the top 10 videos with the most likes among all the entries for the three categories. 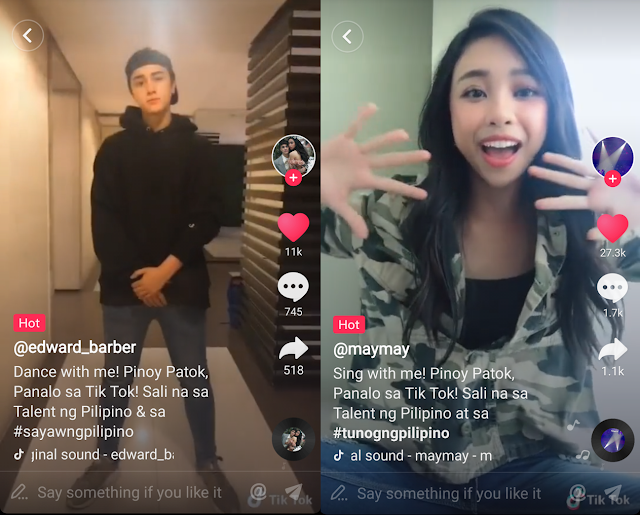 Selected entries will get surprisinggifts from Tik Tok and an invitation to the Meet &amp; Greet Party in Manila on June 24! - Most Talented Award: Tik Tok will put a verified badge on accounts of the top 5 videos fo each of the three categories. The 15 participants will also get Php20,000 each and will be invited as guests to the Meet &amp; Greet Party in Manila on June 24! Since its launch in 2016, Tik Tok has become a sensation worldwide. In fact, it was the most downloaded iPhone app in the first quarter of 2018. Tik Tok turns any smartphone into a mobile video studio by providing a series of editing tools, special effects, filters, and stickers. Users can directly shoot and edit their videos within the app to achieve professional effects. Every day millions of videos are uploaded to the Tik Tok platform from all around the globe. It has developed into a video community with an increasingly diversified content ranging across singing, dancing, comedy, skills shooting, talent shows, and many other original performances.